Look that adorable, fuzzy spider asking for a hug! I'm gonna go give her a hug. Ow! Ooooow! I am bit! I am bited! The pain. The indescribable pain! Someone tell the orphanage there'll be no Santa Claus this year. 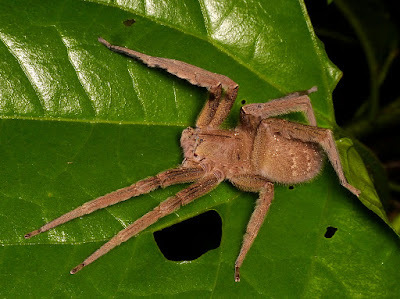 Brazilian Wandering Spiders are the deadliest spiders in the world, capable of destroying entire squadrons of battle-hardened veterans with a single, venomous thought. Their venom is so potent a mere quarter of a pint diluted in water can render an acre of arable land desolate and lifeless for decades. Despite the dangers, scientists working in fortified, military laboratories are currently conducting research on the venom for possible applications in death rays, death rains and miasmas of death. Other scientists are attempting to distil pure evil from the venom in the hopes of developing medications that could be used to treat criminals and other patients suffering from evil. OK, you got me... Brazilian Wandering Spiders aren't THAT bad. Sheesh, there's no fooling you, is there? They're still kinda scary, though! Their venom is so powerful it earns them a place in the Guinness World Records as the most venomous spider ever found in a pint of Guinness. Er... I mean world. 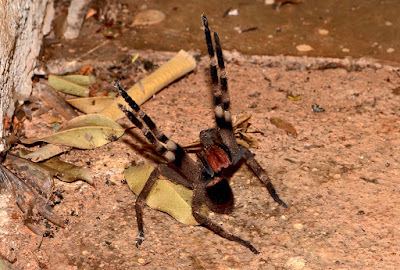 Not only are Brazilian Wandering Spiders incredibly venomous, they KNOW it, too! They're big but not fantastically huge, with legs spanning some 15 cm (6 in) and a much smaller body length. They're not some huge, bulky tarantula thing. 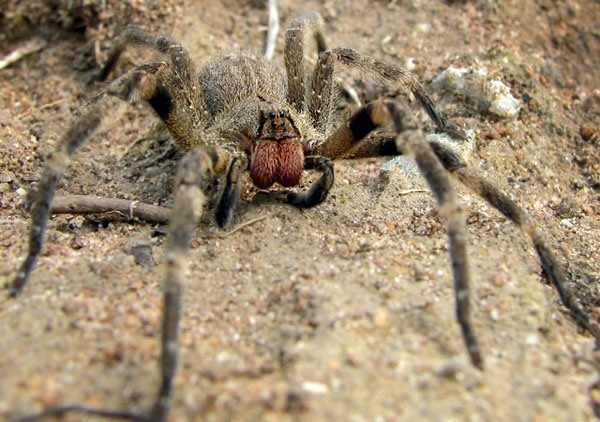 However, they're much more aggressive and fearless than most other spiders. Including tarantulas! They won't actively chase you out of your house shouting "I know where you live!" but if you're not an arachnophobe, watching an angry Brazilian Wandering Spider might help you see the world through their eyes. An infuriated Wanderer will rise up on her four hindmost legs and raise the others high above her head, exposing the dramatic and hopefully eye-catching stripes on the underside of her legs. She's basically saying things like "do you know who you're messing with?" and "don't you know who I am?" They're real divas that way. Which is good! I generally prefer dangerous things to look as if they're dangerous, and a suspiciously courageous spider falls into that category quite neatly. 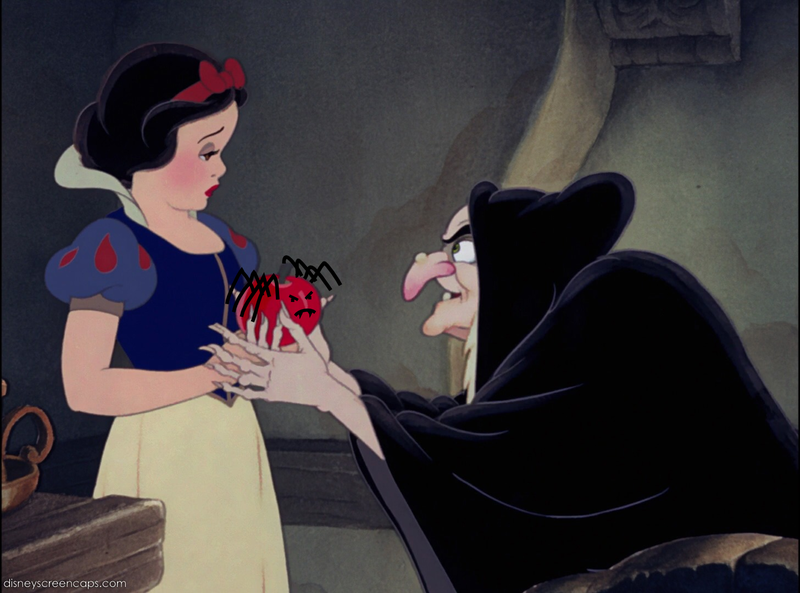 History would've taken a very different turn if that witch had asked Snow White to pet her angry spider. 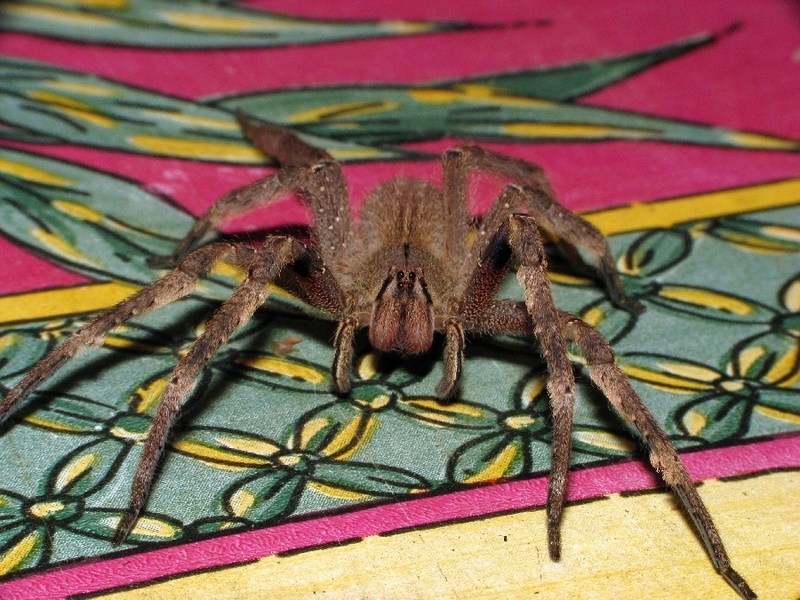 Alas, there's more than one kind of Brazilian Wandering Spider! There are eight species all belonging to the genus Phoneutria, which means "murderess". They simply can't escape that venom thing. 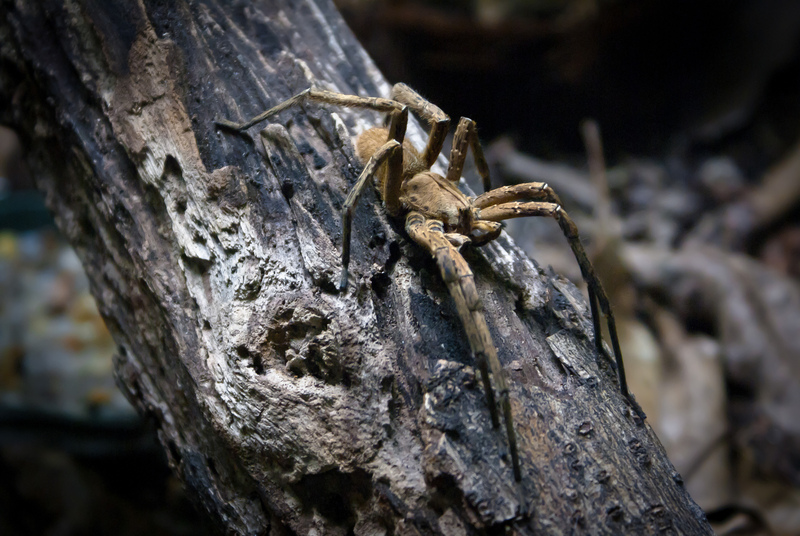 As you would expect from something called a Brazilian Wandering Spider, they come from Brazil. Some of them are also found in other parts of the Amazon in places like Venezuela and Peru while one extends all the way out to Central America. 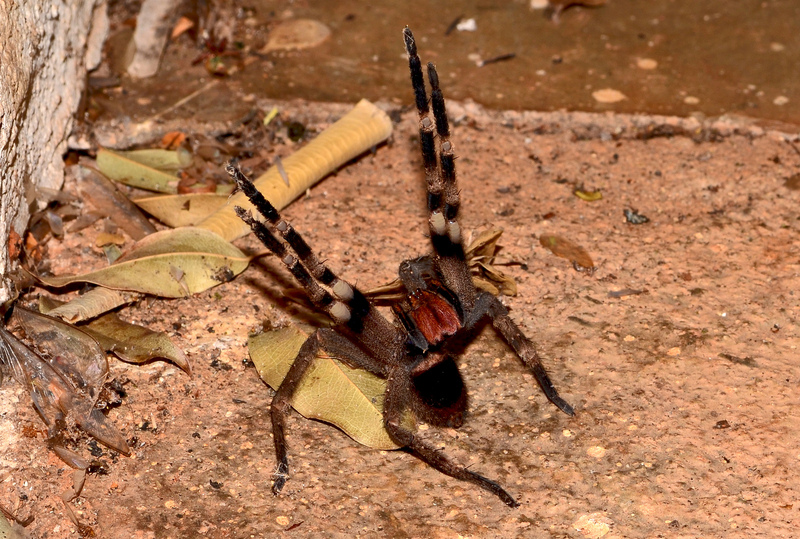 And as you would expect of something called a Brazilian Wandering Spider, they wander! These free spirits refuse to be confined to a web or cooped up in some dank hiding place. They spend the nights travelling through the forest, having a jolly old time hunting insects and the odd frog or lizard. That's the kind of thing you can do when you possess excessively powerful venom. During the day they'll finally do the "hiding place" thing and rest their sleepy head in some dark secluded area like under a log or in a termite mound or someone's shoe. Most species don't tend to get too close to human dwellings but... it can happen. Whether they find themselves in your house or your local greengrocer, it's always one big misunderstanding. The world's wanderers seldom keep abreast of the civilized world's changing mores and expectations. They just wanted some place to sleep. Why would you make a thing you want to eat look exactly like somewhere nice to sleep? And after they go to so much effort to look exactly like something that can hurt you. In any case, with all that fear and anger bubbling around, someone might get bitten. Probably the human. 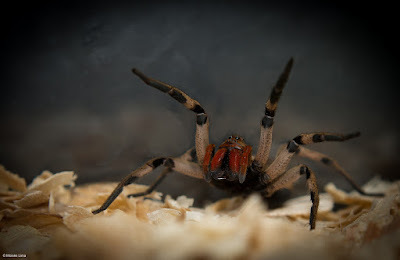 Brazilian Wandering Spiders can control how much venom they inject when they bite and they often don't inject any at all. Mercy! A full dose can lead to pain, inflammation, loss of muscle control, paralysis, asphyxiation and death. A mere 6 micrograms of venom injected into the veins of a mouse can kill the mouse! That means a single gram could kill over 150,000 mice if you went to all the trouble of injecting it. Which would make you weird. For humans, Brazilian Wandering Spider bites are seldom lethal and antivenom is available to boot. However, one odd effect of the venom is something called priapism, or an erection that just won't stop. It's a condition named after Priapus, a Greek fertility god who proudly displayed his continuing lack of self control long after adolescence. Priapism from Brazilian Wandering Spider bites can last for hours, it's like someone spiked your bananas or your shoe with Viagra. Scientists are studying the venom for potential treatments for erectile dysfunction, hopefully weeding out some of the side-effects like pain and death. These studies involve stimulating erections in rats by injecting certain chemicals from the venom into them, which, I think we can all agree, is not weird at all. Man, I knew there were scientists in there somewhere! Raise your arms in the air if you just don't care! 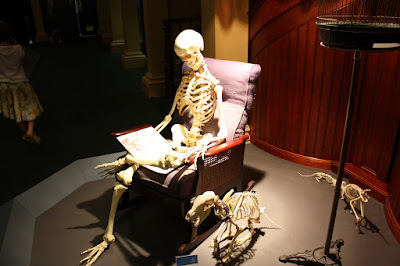 @Esther: I WISH they didn't care! They're angry instead. Which is... different. @Porakiya Draekojin: Ha! Nope, not one bit!